Hi friends! I spent the better part of yesterday recuperating from our busy weekend and then trying to get myself organized for the week ahead! Ideally, I’d have a head start on that on Sunday night, but I was knee deep into Southern Charm reruns, so I had a hefty to-do list to create on Monday morning. 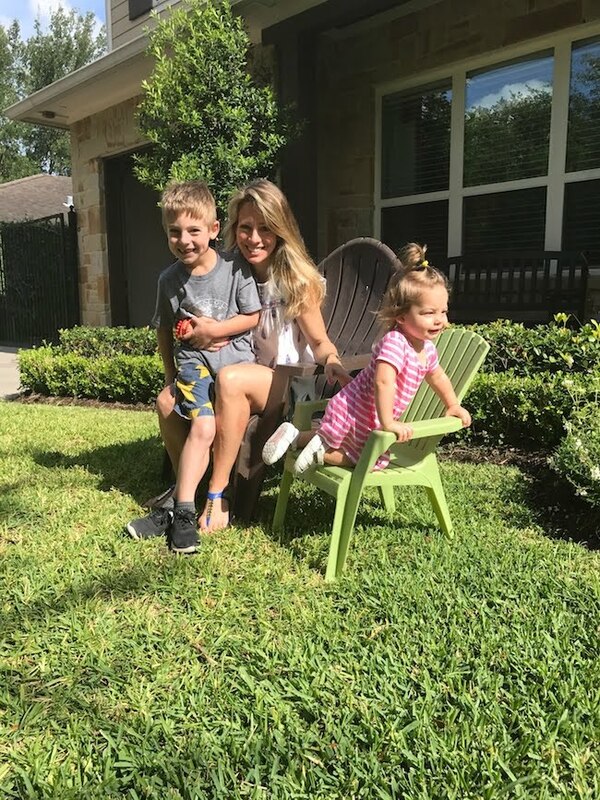 Did y’all have a good Mother’s Day weekend? I hope you got spoiled rotten and felt so very loved! Our weekends lately have been filled with lots of eating out! This mama doesn’t like to cook on Friday, so if the kids cooperate, we try to go out. You too? Last Friday, I wore this oldie but goodie maxi dress. I’ve had it for years and always get lots of compliments on it when I wear it. It’s lightweight and partially lined and under $40! It comes in several colors and patterns too. It’s a little long, but with wedges, I didn’t have to get it altered! The last couple months, our weekends consisted of lots of baseball, and we had our last regular season game on Saturday at 8am. That timing made it perfect for heading to breakfast afterwards. 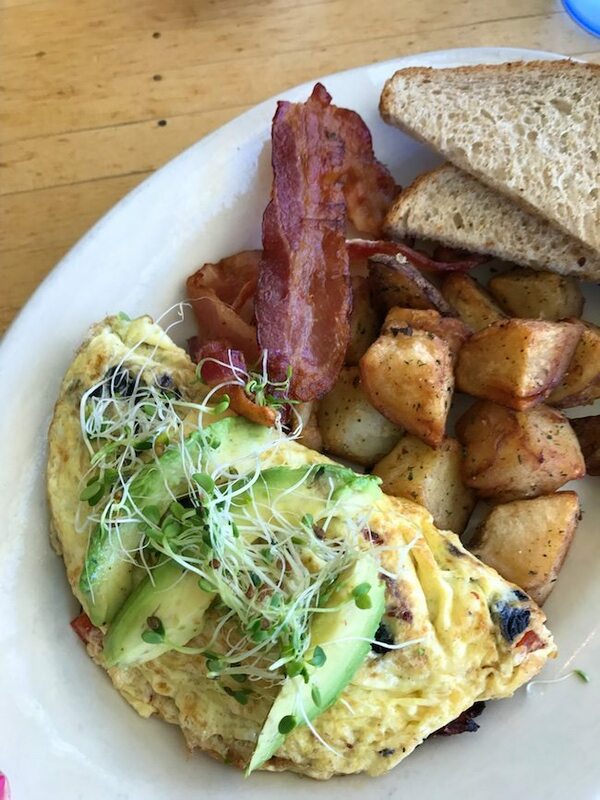 If you’re in Houston, a great cafe in the Heights is Lola and I loved their California omelet. It’s got sundried tomatoes and goat cheese inside. Super yummy! Sunday morning I woke up to two sweet cards and my favorite Ghirardelli chocolates along with the news that we could spend the day however I wanted. #winwin I voted for brunch at one of my favorite spots, Empire Cafe. That place has a laid back, casual vibe with great food. I always get either the Italian Toast (with the fruit on the side because if they put it on top of the toast, it gets soggy), or the San Antonio breakfast wrap, which is a tasty breakfast burrito with avocado and Mexican salsa on the side. I’m so very thankful for my two kids. They both have sweet spirits and I swear my heart could not love them any more. On the “whatever Mom wants to do today list” included a trip to the pool. 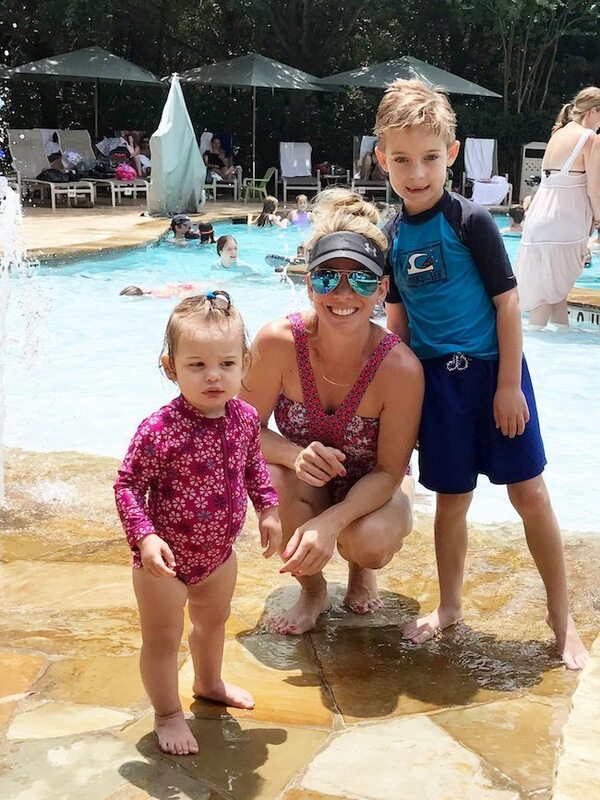 I like getting out in the sunshine and splashing around in water with these cuties. The frozen pina coladas don’t hurt either! We had our fill after about an hour, but it was still fun. My “happy Mother’s Day to me” gift worked out perfectly! 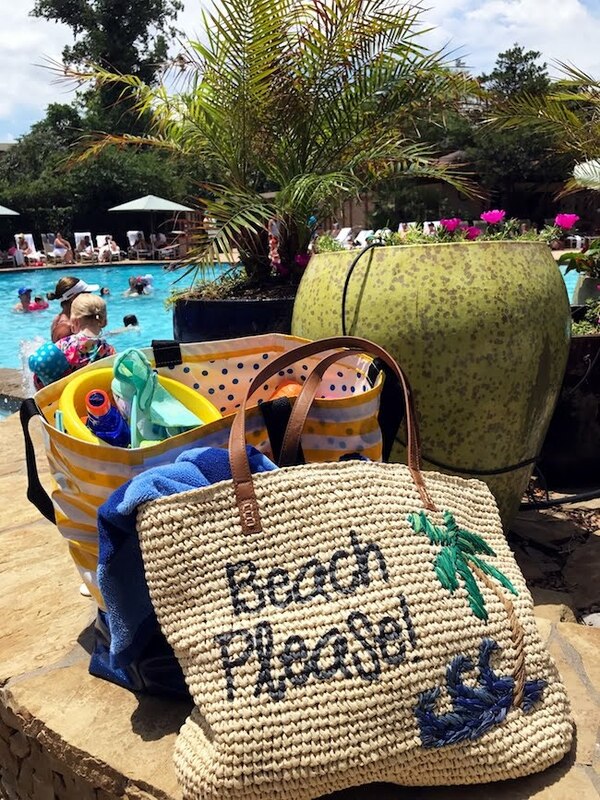 How cute is this woven tote?! 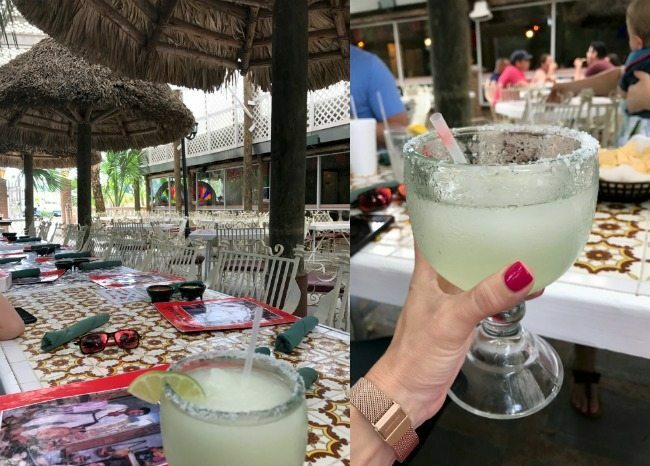 And then that night, we got together with our whole family for nachos and margaritas. Either I’m a lightweight or these margs were strong! One was plenty! I wore this midi dress that fit perfectly after I chopped 5 inches off the hem! The material is nice and thick and stretchy and I love that it has pockets! So, now it’s Monday (Tuesday when you’re reading this) and I’m sitting here looking at my calendar which says ONLY TWO MORE WEEKS OF SCHOOL LEFT! Wow, summer break is nearly here! Our first grade school year flew by and I can hardly believe we’ll have a second grader on our hands! I mentioned before that we have no summer plans yet, so there’s nothing but long summer days on the horizon. I will go stir crazy with nothing to do so I’m sure we’ll make some plans, I just don’t know what they are yet? Have y’all made plans for summer yet? Most of my friends have lots of camps planned, but we haven’t committed to any yet and they might be full by the time I get my act together to try to enroll! I’m hoping I can get a few decor projects done this summer! I really can’t procrastinate on those any longer! Yes, this one requires continual updating as kids grow and their interests and hobbies change. Usually every year either in December or January we do a big clean out/purge/organization session with the toys. We skipped that this past year so we are overdue, especially since we have two kids now and Jordan’s toys are starting to multiply. We still have two toyboxes in our living room holding random toys, but we now also have 3 big woven baskets (allegedly holding just Jordan’s toys), and then games and puzzles in the media cabinet too. That photo above is when everything is all nice and cleaned up, but I had to snap a picture of what it looked like at about 6:24 p.m. on Monday evening. Not too bad because we do tend to keep it pretty picked up, but there are lots of toys in this house! I created a pretty good organizational system in our Playroom/Media Room by moving the bookshelf that was previously in my office into that room. I bought cute bins that fit neatly into the cubbies and created labels for all the toys so our son could easily put things away when he was done playing with them. He’s actually quite eager to put things back into their correct categories and doesn’t like to mix bins, but he always wants “help” cleaning up. 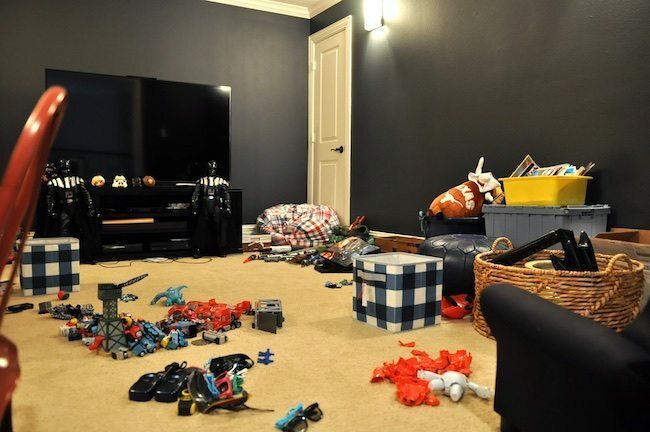 Set the timer and give him 10 minutes to quickly get everything off the floor and back into the bins, or, if he’s needing more assistance, I’ll break it into smaller tasks like 3 minutes to pick up all the legos, 2 minutes to put all the Star Wars toys away. But, this still requires me to be in their dishing out orders and he’s 7 now, so he should be more in the 10 minute “clean up everything” category. He can set the timer himself and he likes the challenge of trying to beat the clock. But this brings me to #2 . . . .
You might have realized that all the bins in the playroom are specifically for James’ toys. Well, move over brother, sister is in town now! She needs a place for her toys. Granted, a lot of her toddler toys are too big to fit neatly into bins and then those just need room to line up against a wall or something, but she still needs a couple bins of her own. But the main thing is, we need seating! We currently just have a bean bag chair and my old rattan chair from my old office. I changed the wall color to a really nice super dark grey with the thought that I’d love to put a small white sofa in there. My husband wants gaming chairs. We’ve been at odds over this, but I swear if I find a comfortable couch he’d be happy with it. He just doesn’t know it yet! I’d be fine with gaming chairs if Jordan and I never planned to sit in there . . . I actually did look online for gaming chairs and they are dead ugly. If someone could invent pretty gaming chairs and decent maternity workout clothes, they’d be millionaires! Nike and Zella, I’m talking to you!I’ve looked forever for a decently priced, comfortable and perfectly sized white couch but it’s so hard to pull the trigger because lots of the options are online only so you can’t test them out. And other options are super pricey! Based on most of the reviews I read, most people loved their Ikea sofa, but this Dissenting Opinion about all the washing required to keep it looking good and how hard it is to stretch the slipcover back on has me cautious about it. 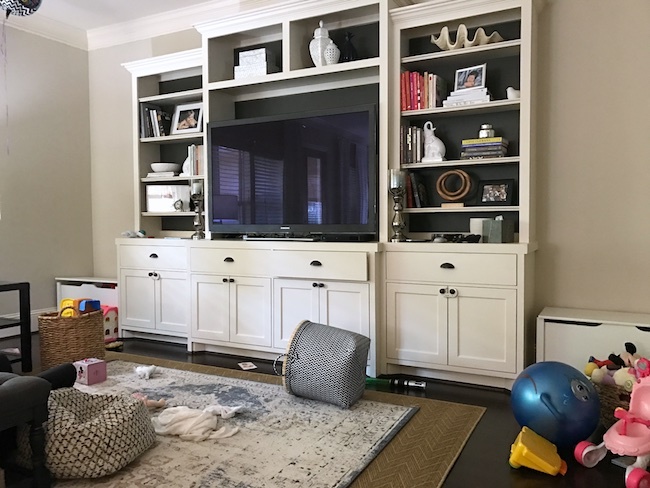 And here’s a good post comparing the Ikea Ektorp and Pottery Barn Roll Arm Slipcovered Sofa with pros/cons of each and dimensions (and the family is just too cute!). Do any of you have a small white sofa you love?? 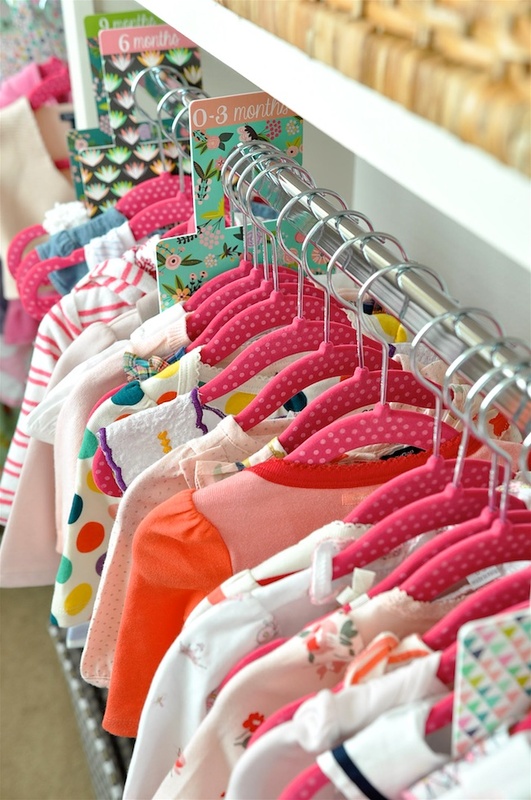 When I was “nesting” before Jordan was born, I hung her darling little baby clothes up in her closet and separated the sizes with the cutest baby closet dividers. This girl is growing at lightening speed so lots of things obviously no longer fit and are being kept in a plastic storage bin in her closet and kept for safefkeeping for the next baby girl born to our family. #luckygirl! We’ve also been so blessed to be given lots of hand-me-downs from Jordan’s sweet little girl friends, and I need to go through those bags and organize them. I bet she can start wearing more of them soon!And, I’d love to make her closet pretty pretty with some decals or paint. I’ve got a few ideas, but need to think on that some more. James’ closet is still doing great from the Container Store Elfa makeover and since he wears a uniform to school, it’s been easy to keep it organized. He wears more costumes and pajamas than actual clothes! I will need to go through his drawers and see if he needs new shorts/tees for the summer. #addtothelist!I plan to tackle the toy situation in the next couple weeks so summer is off to a somewhat civilized start. 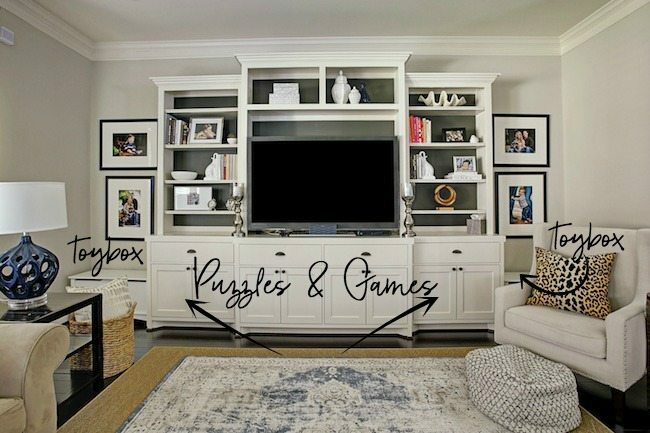 The playroom design will be next and then Jordan’s closet. Y’all hold me to it! Maybe if you keep me accountable, we’ll actually have something to sit on soon! Join me on Instagram and Facebook, where I post everyday outfits and inspiration to wake up your wardrobe! I'm finding that summer planning is tricky with a five year age gap and a napping baby! Plus, I really am not one to sign my 6 year old up for a lot of activities. We're keeping it simple this year with a little golf camp two days a week (just one hour in the mornings) and lots of trips planned to the pool and park in the mornings. We'll definitely have to get up and out early so we're back home for nap time! I'm also hoping to take him back to the pool sometimes in the evenings, just the two of us, for some one on one time because I know watching him and chasing his little sister around the pool is going to be rough this year! Really true! Everything revolves around the naps! I've learned not to sign my son up for things too early because he often would rather just stay home! White leather sofa from Haverty's. It looks kind of modern. You can clean anything off of it. My toddler colored with a black sharpie, and I got it off easily with hand sanitizer and a magic eraser. Oh man, I would've been scared seeing that! Our living room sofa has been easy to clean too! Luckily! 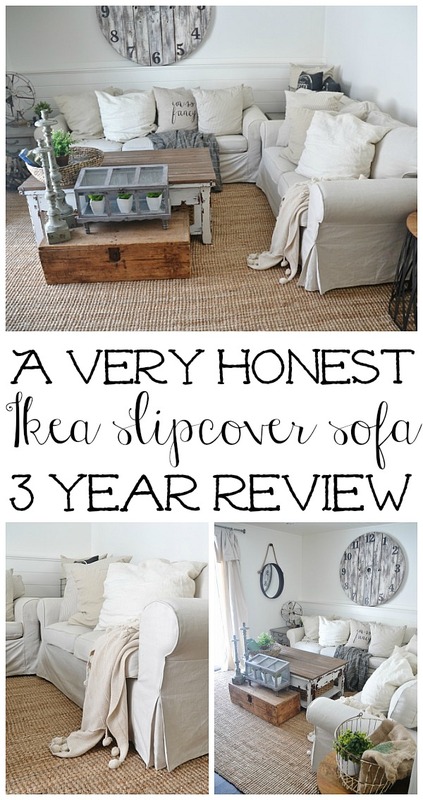 I highly recommend IKEAs sofa. We have 2 in our living room and couldn't be happier. They are 2 years old now and every bit as comfortable as day one. That's with 7 kids home with me full time (homeschoolers!). My point is they get constant use! Taking them off and putting on about once a month to wash is a workout but very doable. We went with a natural flax like color in a linen Cotten blend and love the warmth of the color. The nice thing about their white covers is they are very affordable ($50, I think) so if stains happen you can replace without breaking the bank. I'd be concerned about a white non-slip covered sofa since it can't be washed. Hope this helps! And I second you on maternity workout clothes! My son recently started saying he might want to be homeschooled! Thanks for letting me know you like your slipcovers. I need to pull the trigger soon! I especially love a maxi I don't have to alter! #petiteproblems! 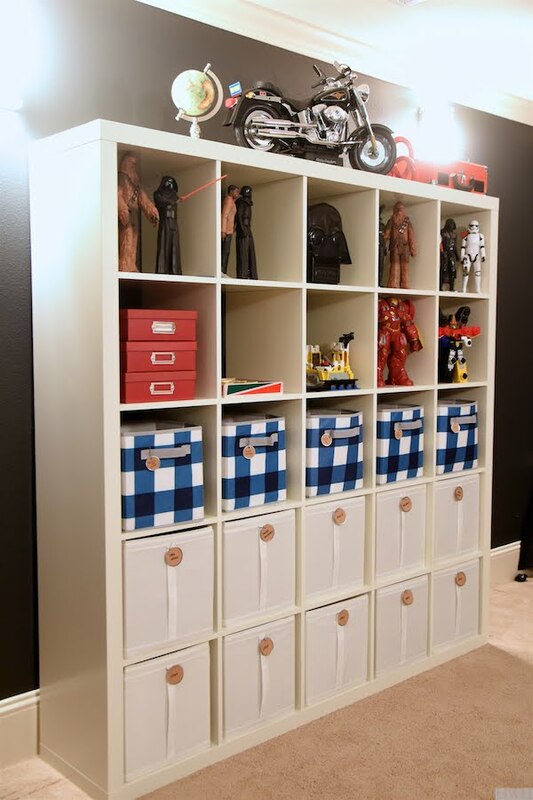 I look forward to see what you do with toy organization — this is something that I need to do this summer too! The toys always need a going through every once in awhile. I hope we can knock this out one weekend once baseball ends! I only wash the covers that are dirty, as they are work to get off and on. They do come clean. Mine is from Room and Board and I bought is used off Craig's List. I do LIKE being able to wash it. I've heard they are a workout to get back on. It's hard enough to get Jordan's crib sheet back on her crib, I don't know if I'm up for a whole couch! And I'm sure I would be the one putting it back on! I feel like husbands don't get a lot of say in our decorating plans. So I would let your husband get two gaming chairs and then add one perfect chaise lounge for you and Jordan! Or I would go with leather. I raised two gaming boys and one sweet girl and leather held up well through everything! That's definitely true in our house because my hubby doesn't really care about decor that much. I think he's glad I have y'all to bounce ideas off of! 🙂 Even with the gaming chair, he can't find one he really wants. But, the room is too small to do two gaming chairs and a chaise or that might've been a genius solution! I definitely want us all to be able to enjoy the room. I'm gonna give leather some thought because I think you're right- it holds up so well! Looks like you've got a set plan! And your Sunday looked so fun!! Thanks for stopping by Alexis! I would highly recommend the IKEA Karlstad sofa. My husband and I have had one for years and it is seriously the most comfortable piece of furniture we own while also being stylish. One of my friends babies even had an accident on it once and after washing it everything was totally fine! Just stumbled on your blog and noticed this post! 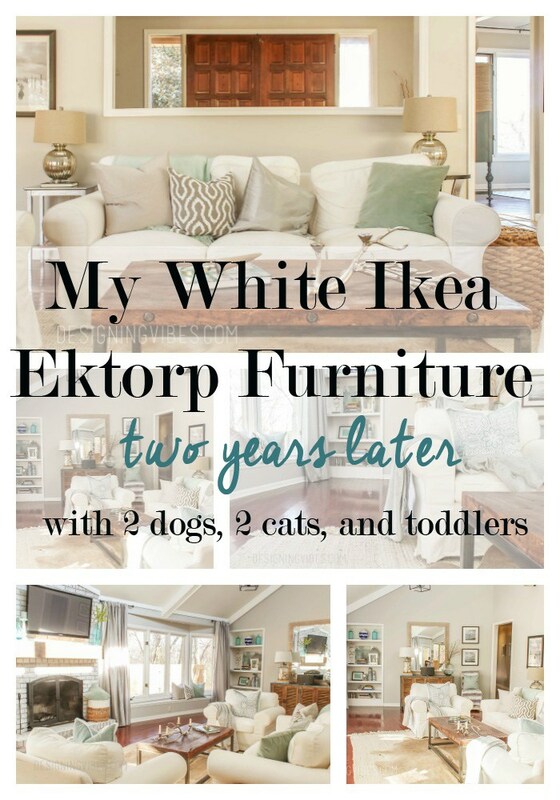 We have had the ektorp in white for 5 years, and have loved it through two kids and lots of play date and party spills (including red wine). The trick on washing: wash on warm/hot with oxyclean, then dry for just 15 minutes and put it back on slightly damp. Never have to fight it back on because it doesn't shrink, and it dries without any wrinkles! We wash the cushions about every 6 weeks and the larger frame cover maybe quarterly. It still looks practically brand new!